When deciding what type of window covering to use, two of the most popular options for Australian homeowners are blinds and curtains. But which one is best for your home? Although window furnishings are definitely considered a design element, adding to the overall style and interior design of your home, they also have important functions and features. 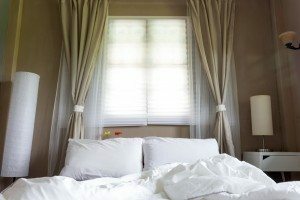 Let’s take a look at the pros and cons of both curtains and blinds to find the right fit for your windows, and the right fit for you. Considering Blinds for Your Home? Blinds are available in a wide range of styles and designs, from sleek aluminium rollers to warm and natural timber Venetians. Blackout blinds can block out all sunlight for those requiring uninterrupted sleep during the day, such as shift workers or small children (or parents!) Unlike curtains, they won’t move from breeze or let light in through their centre part. Certain designs can be fitted inside the window recess so they don’t project out into the room. This can be a definite pro for blinds when space is limited, such as studio apartments or small bedrooms. Blinds generally cost more than curtains – particularly those that require some form of operational mechanism. Like blinds, curtains are available in a wide range of fabrics and styles, from sheer and lace to heavy opulent drapes. As they generally require no pull cord to operate, curtains provide a safer window dressing option than blinds – particularly for small children and pets. As it is generally desirable for curtains to overlap the edges of the window, it does not matter so much if they are not made to measure. Blackout curtains are available however they may leak light more than blackout blinds. Curtains can ‘leak’ light in around the sides or through the central gap. On the plus side, sheer curtains can be beautifully decorative, allowing sunlight to shine through and adding soft, subtle style to a room. Animal hair and dust tends to stick to heavy fabric curtains, meaning upkeep is a more regular task. In smaller homes and rooms, curtains can protrude outwards into the limited available space, whereas blinds can sit neatly out the way inside the window recess. Remember, whatever option you go with, you’ll be responsible for keeping your window coverings clean and in good condition. You’ll also need to install them once purchased, which may impact your decision making. Curtain installation, unlike more complicated blinds, is fairly simply and can be done by most people without the help of a professional. Check to see whether your retailer offers free installation services when you select your product – this may make your decision easier, while saving you time and money. One last thought: why not both!? You can have both blinds AND curtains. Install blinds in the window and then place curtains over them. When the blinds and curtains are closed, there is no light shining through, but with the curtains open, light can still be controlled. For people having trouble deciding between curtains and blinds, this combination can be the best of both worlds! If you would like more information to help you choose between blinds or curtains, contact a window covering professional, such as Modern Blinds. They’ll be able to help you out with advice and product knowledge, and even arrange a free no-obligation measure and quote.